Tombow brush pens are one of the most wished for bullet journal supplies and today we’ll show you what’s so great about them and which colors to choose! 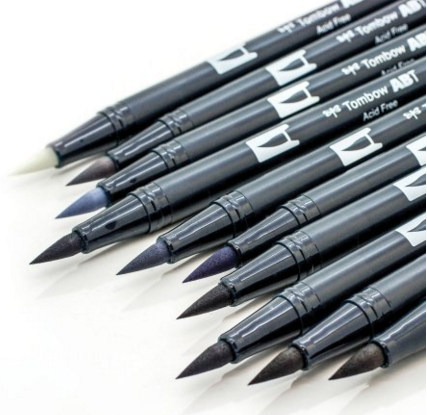 If you ask a fellow bullet journal lover what their favorite pens are for journalling they’re pretty sure to tell you how much they love Tombow pens! They were originally a hit with adult coloring book fans but now every BUJOer wants a set in their pencil case! 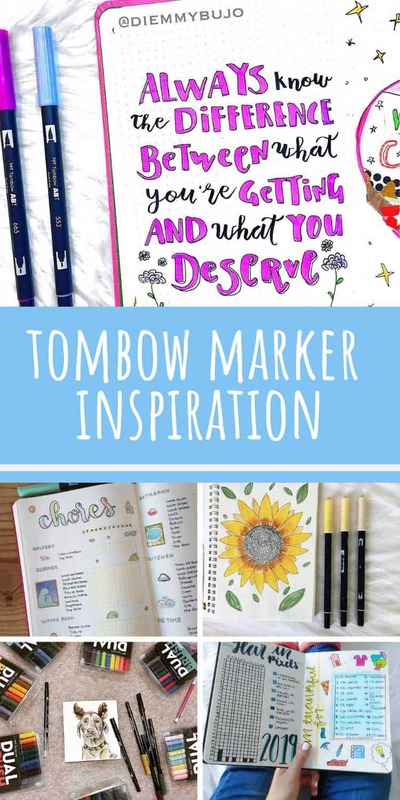 What’s so great about a Tombow? 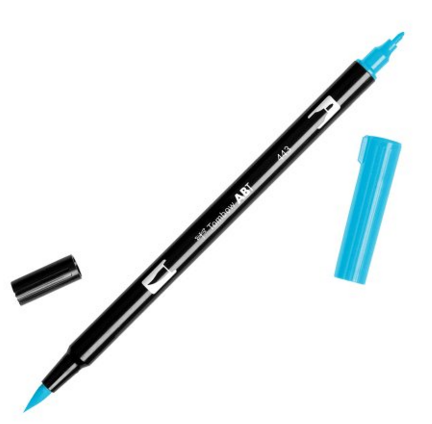 Well they have a long and elegant brush tip that you can use in so many different ways. For example you can distribute the pigment on your page using a water brush or a paint brush dipped in water letting you practice watercolor painting without the mess. They also have a really good pigment, and if you’re working in the small space in your journal you shouldn’t see any streaking. 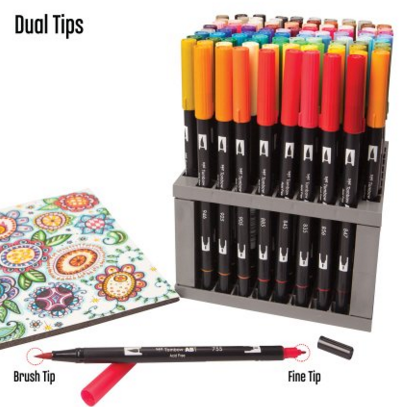 These are dual brush pens so one end has the brush marker, and the other end has a fine tip which is perfect for adding colorful details to your doodles and illustrations or for journaling. 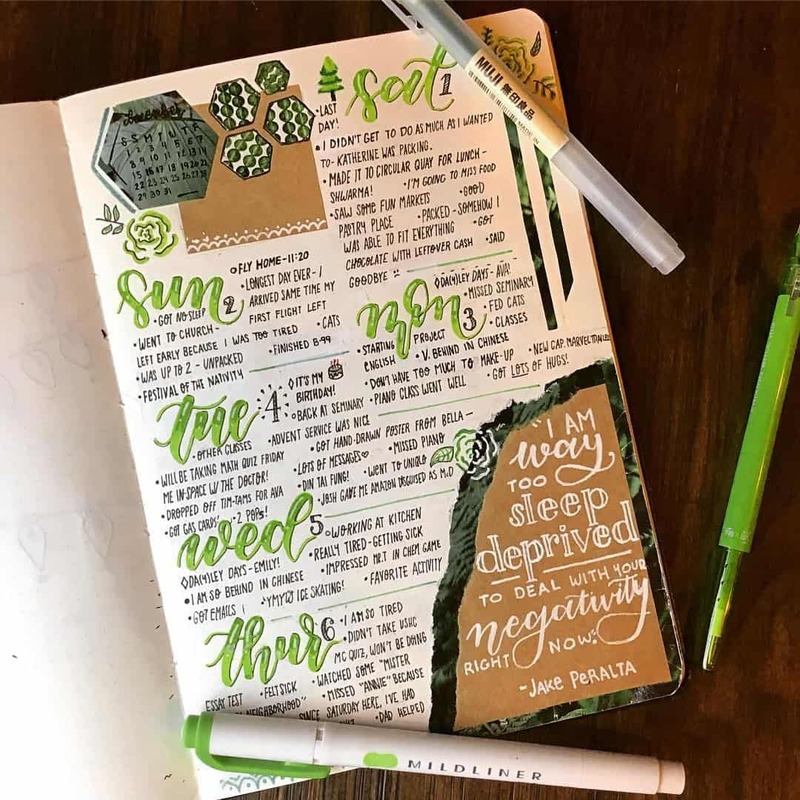 These brush pens are so versatile you can use them for everything from coloring in your cover page illustrations, to decorating your spreads and even adding some highlights to your headings. 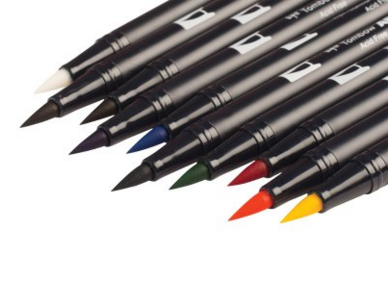 The other great thing about Tombow art markers is that you can buy them in various different sets containing different colored pens so you are bound to find the set you need for the style of picture you are coloring. Let’s take a look at them! 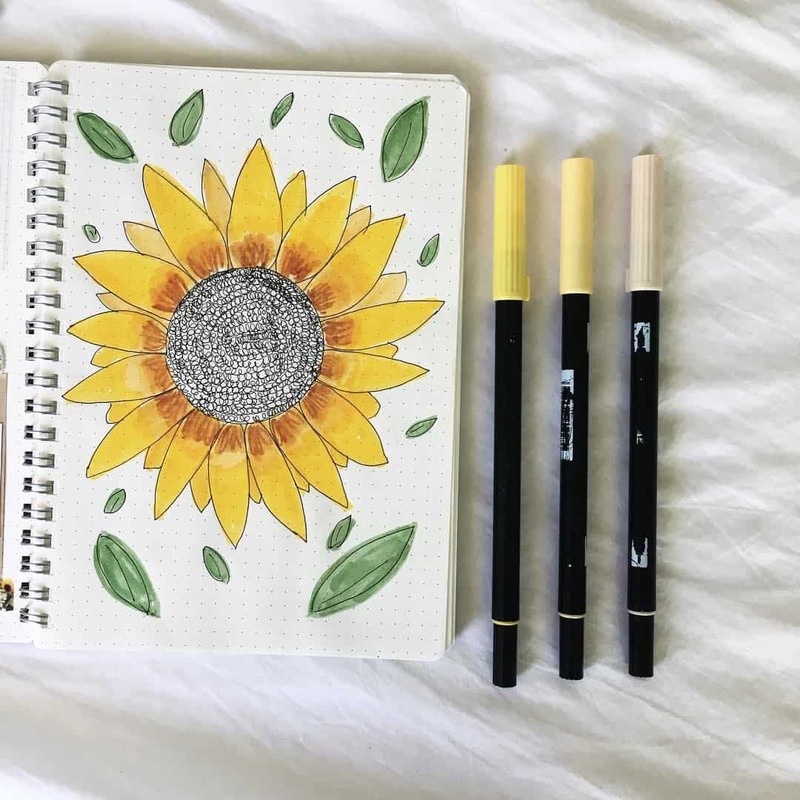 Let’s start with the primary color set which is a great starter set for your bullet journal. You can choose between a 6 pen set (5 colors and 1 blender pen) or a 10 pen set (9 colors and 1 blender pen). 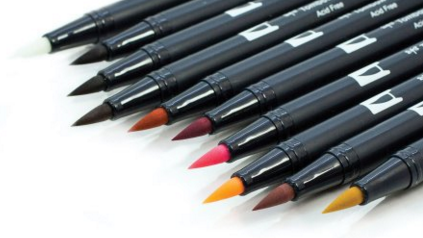 The next set of colors you will want to invest in is this secondary set, again sold in packs of 6 or 10 pens. 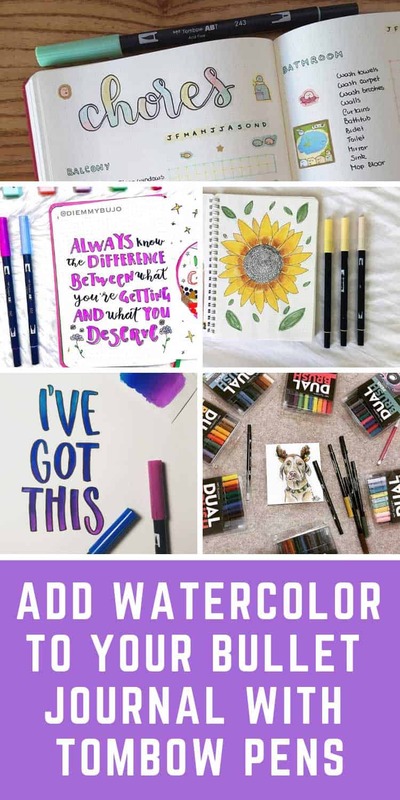 With the primary and secondary color sets you have everything you need to really get started with creating those beautiful illustrations and headers in your bullet journal. 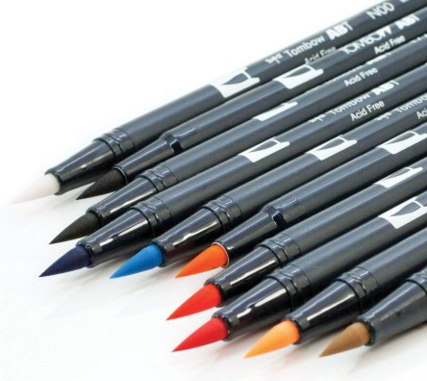 If you love bright colors then this is the set of Tombow dual brush pens for you. 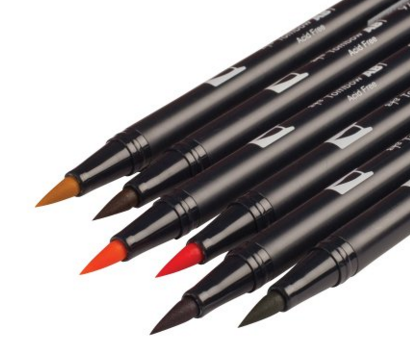 It sells as a 10 pack, again with 9 colors and one blender pen and includes the following colors: 755-Rubine Red, 743-Hot Pink, 933-Orange, 055-Process Yellow, 133-Chartreuse, 173-Willow Green, 493-Reflex Blue, 665-Purple, 636-Imperial Purple, N15-Black, N00-Colorless Blender. Next up we have a set of skin tone colors that are just what you need if you like to doodle faces and people. This set is available as a 6 or 10 pack of pens. If you want to try a fifties theme in your bullet journal you need to check out this set of Soda Shop colored pens! This set of landscape colors is perfect for a green or blue theme across your spreads. If you embrace minimalist spreads and layouts this greyscale set of pens has a range of colors within it to create some depth. 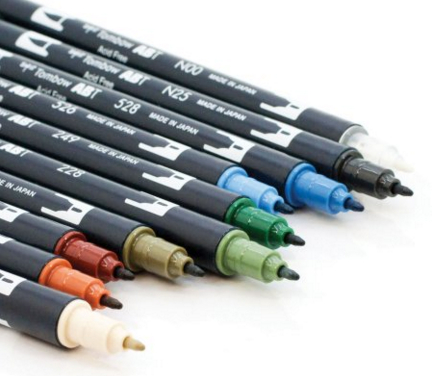 If comics are your thing then you absolutely must have a set of these Manga brush pens to do justice to your illustrations! The name of this set says it all really. If you want your bullet journal layouts to look groovy then invest in this 6 pack of brush pens. Can’t decide which set to buy first? How about investing in all 96 colors at once! 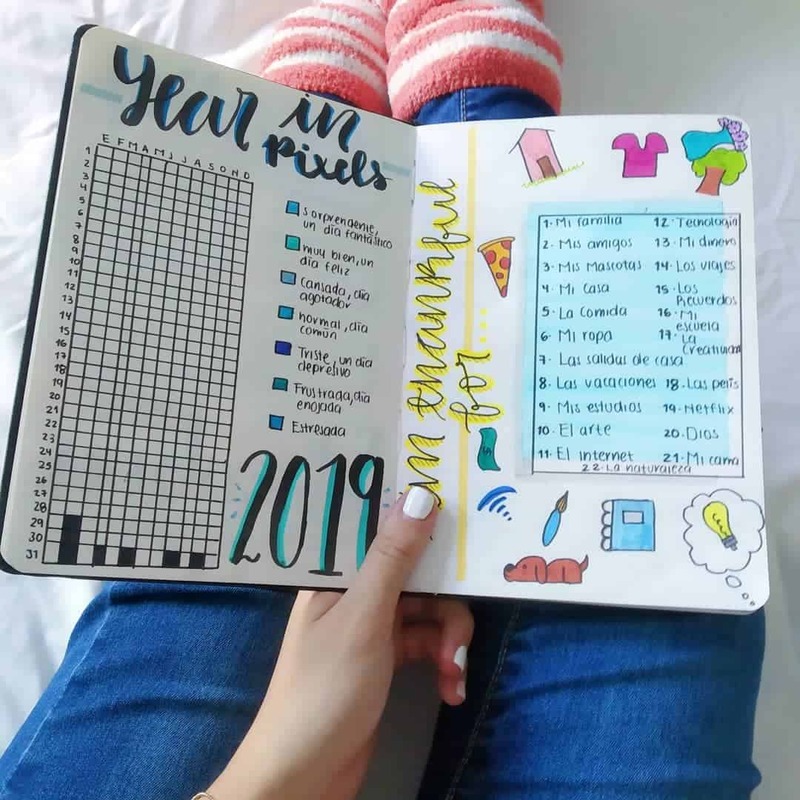 This really would make an amazing gift for someone in your life who loves to bullet journal or color and it comes with a stand to keep all the pens safe and sound. 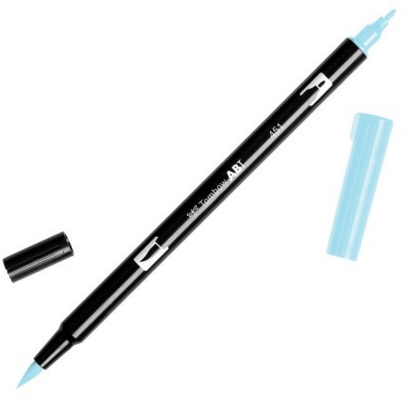 Watch this video if you want to learn more about how to use the pens. 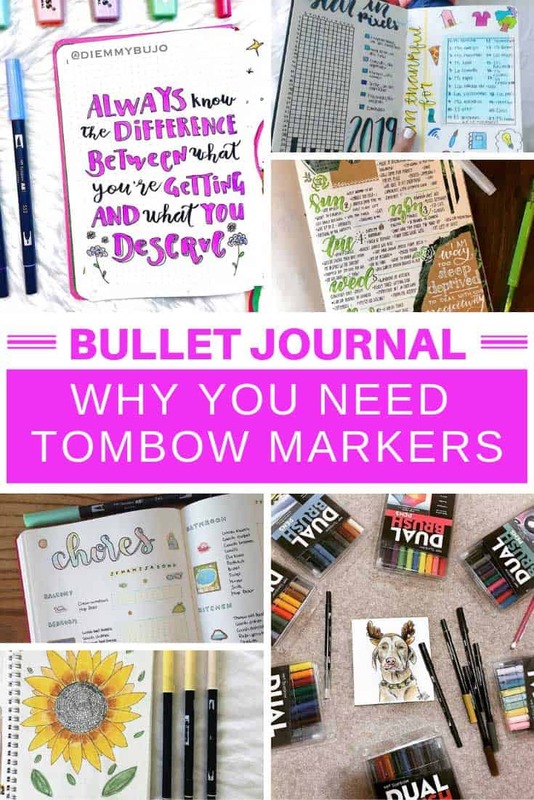 Want to see how you can actually use the tombow markers in your bullet journal? Take a look at these creative spreads for inspiration! 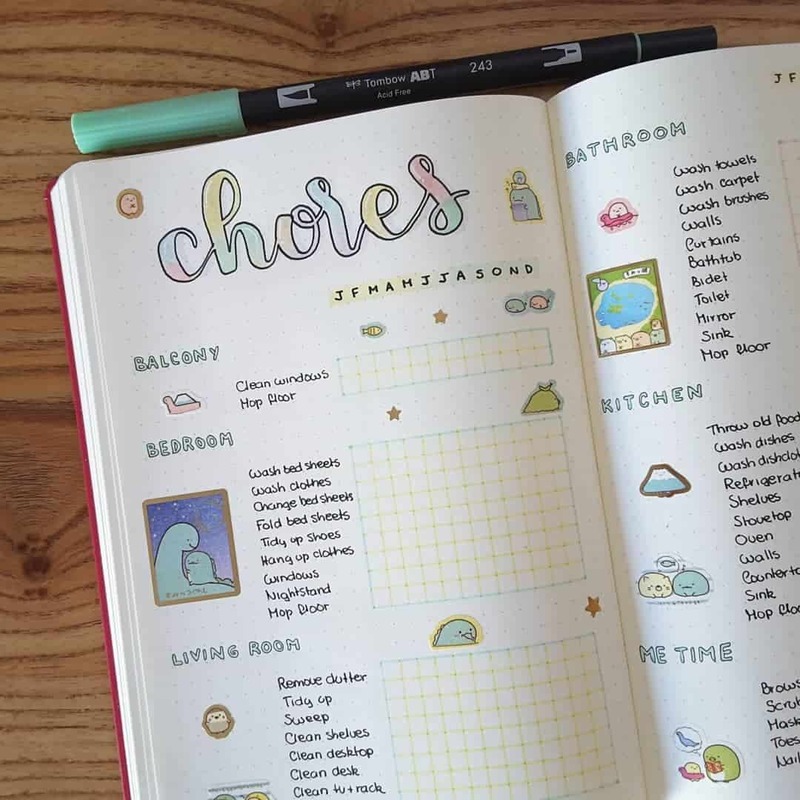 If you’re going to have to do chores you might as well have a pretty pastel rainbow heading to brighten up your day right? 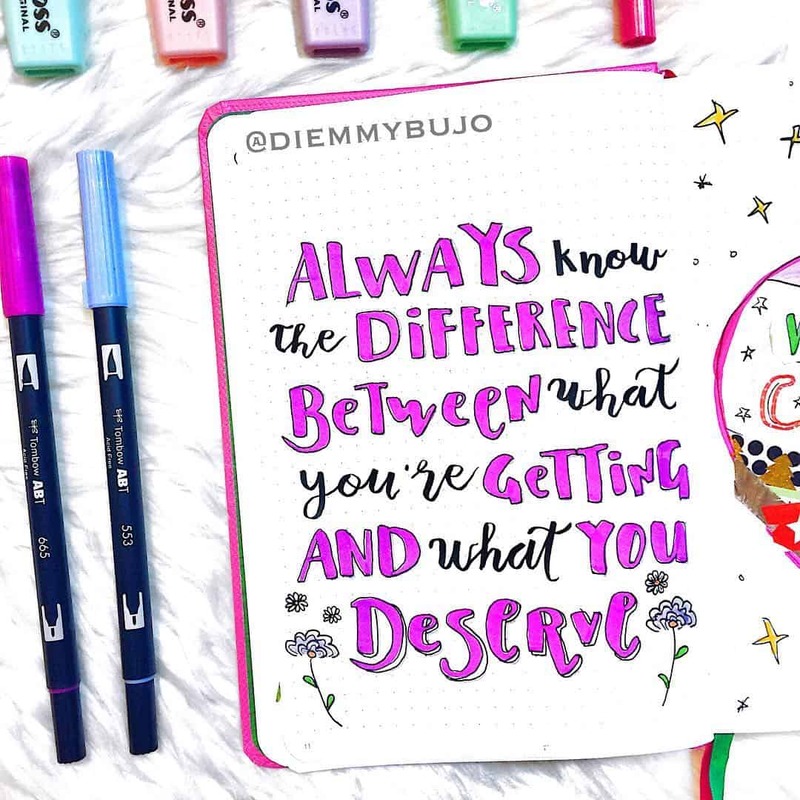 If you like to include motivational quotes in your journal you can use Tombow markers to color them in. 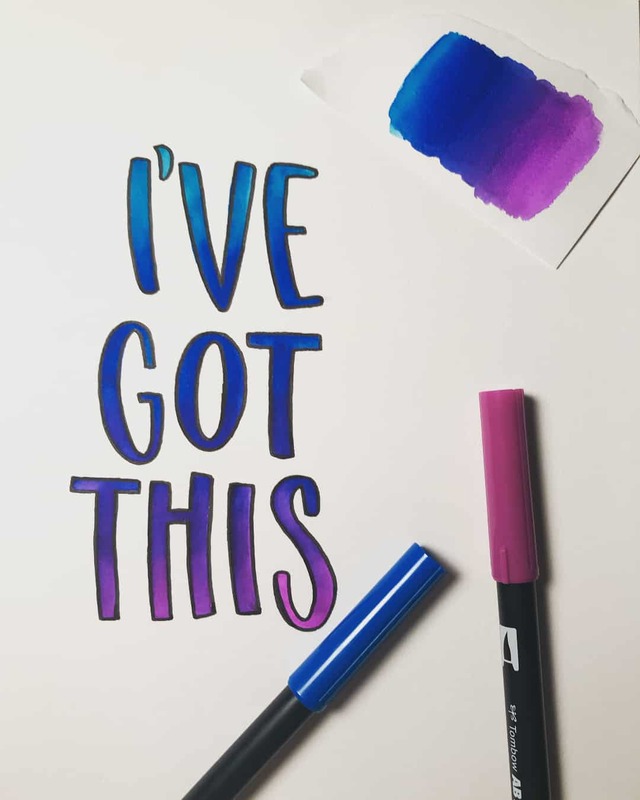 The markers are also great for modern calligraphy, or hand lettering in your journal. Here’s another example of how you can add a touch of color to black hand lettered words. 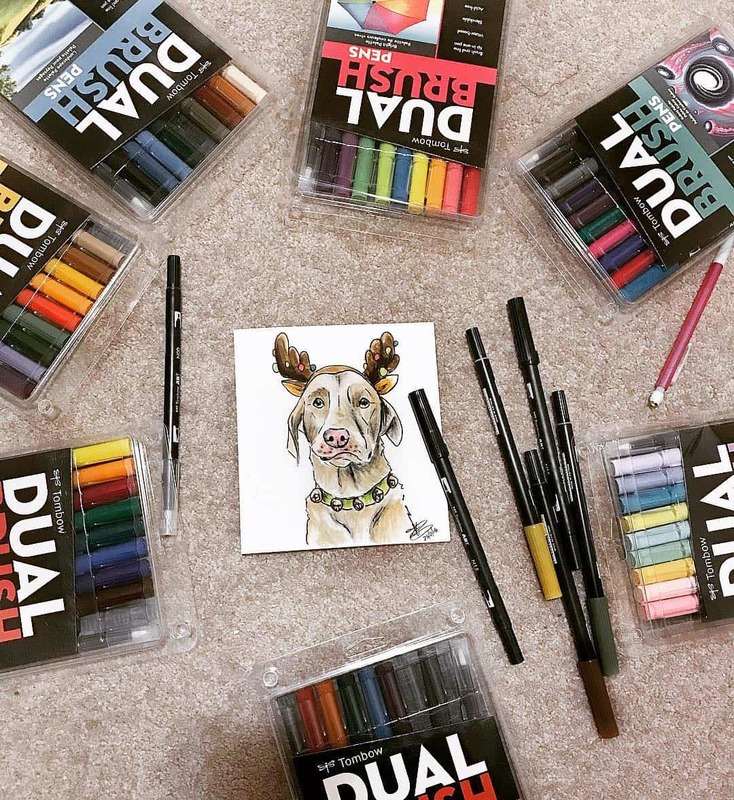 There’s a Tombow haul to drool over right! 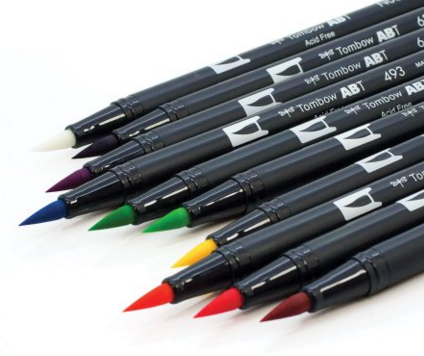 If you love to add illustrations to your journal the tombow markers are what you need to color them in. See how you can use the markers to create wonderful cover pages? And here’s an example of how you can use the brush pens to hand letter your headings on your daily logs.